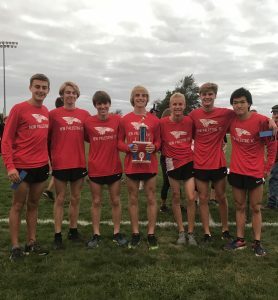 The New Palestine cross country teams swept the championships at Tuesday’s Whiteland Invitational. 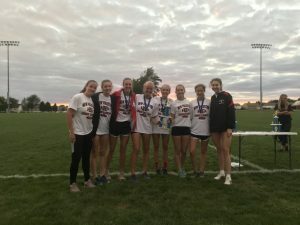 The Dragon girls won with a perfect score of 15, sweeping the top five spots. Brenna Shaw, Kaylin Casner, Victoria Crowder, Kendall Mann and Emily Adam took the sweep. Grace Voelz (1oth) and Sophia Taylor (12th) were the Dragons sixth and seventh runners. The Dragons won in a field of 10 teams. The Dragon boys were first of nine teams with a score of 28 places. NP placed five runners in the top 10. Drew Austin was third, Kyler Harrison fifth, Josh Collins sixth, Caleb Stirm eighth and Devon Whitaker ninth. Josh Ackerman was 16th. The meet was originally scheduled for Saturday, but postponed due to heavy rains that came this weekend. The Dragons next compete Saturday at the Riverview Health Invitational at Northview Church in Carmel.